Rolling backwards, downhill, in a small car, on the side of the street almost exclusively hosting cars traveling in the other direction was the catalyst for brilliance in facial color. My parents the left the country and left us their car, the plan was that they would have it to come back to; the plan was not for mechanisms to crumble under the hood as soon as they left. The most expensive, and to us the most inconvenient thing, was that the repair cost was more that the car was worth. We lived in Hermosa Beach California,a very hilly area, most being at least a block long, all being steep. Most everywhere we stopped or parked we were on a side of a hill or at the bottom one, surrounded by four steep roadways going almost straight up. Our car didn’t DO up! We’d sit outside a friend’s house a long time running the car, trying to heat it up, and trying to determine; how hot the engine was when we’d arrived, how long we’d left the car parked and how cool was it outside. We’d make a guess then after the stop sign, because Hermosa Beach had implanted a sign at the bottom of every hill, we attempted a forward… trip… up. We’d get almost get to the top, and with the driver’s foot still floored on the gas we’d ROLL BACKWARDS! We’d sit in the middle of the street or intersection, warming the car up, and then try it again, and again. On at least one these attempts we’d have an audience! If they were behind us they’d back up and park at one of the stop signs and watch the show, or worse, some cars would accompany us downhill! We were each on our own side of the street. We were going about the same speed. We were going in the SAME direction. They were going forward we were BACK WARD and paralleled to each other all the way to the bottom where we’d both stopped! I didn’t have control of the car or my glowing red rosy color but I did have a repertoire of body language to choose from! I, being the passenger was watched by the gawking occupants of the downhill car. Lucky me. Truth In Advertising And Washington? Old Yeller or Old Mellow? My dad- in- law might not have cried when the yellow dog died too young because he was too busy bemoaning the fact that he was getting old. As he aged he became mellow and thought he’d lost his argumentative character and his masculinity! I’m at the age he was then but I still argue with most everything I see and hear. But yesterday, for a few minutes anyway, I agreed with an article and two successive commercials on the radio and found this delightful. I heard the end of the refinancing commercial saying,” We engineer to amaze!” and I had to agree. From a studio in Washington DC, a panel of people, I know of, but have never met, but am expected to respect, talked about (brace yourself) THERAPUDIC BOMBING!” Then came a serious and concerning conversation about what my government knows and doesn’t know about Syria and the commentator stated a grand truth about Washington, “We have no human intelligence!” WOW! Was this to be inclusive or a ‘them and us’ type statement? Then I even agreed with the first commercial which said, “Is your house under water?” and right away I thought of stairs enclosed in a giant tube of air. The tube continued all the way to the front door. I’d probably never opened the door because I was too busy watching the fish. Submarines in three sizes, depending on how many are leaving and coming would be waiting. Or maybe my front door is grounded on shore and connects to a very long descending set of stairs to my house under water. Or the front door might be bobbing around on the surface, also connected to a descending staircase to the house but this set of stairs is extremely flexible and would swirl and bob on the surface like a cork on a line. My new housing plan is called Dungeons and Dragons with a Vampire Ambiance. I understand the benefit of homes stacked six high but I also miss the beautiful old homes as they’re mowed down to be replace with high rises. Solution: put the six stores down instead of up, and underneath the existing old neighborhood homes. A hard working man could come home to a nice cozy neighborhood home and still not have to cut the grass. Many of my friends never open their drapes anyway and prefer the dark to accent their video games and vampire literature. A few years ago I drew a picture of homes going down into the ground instead of up into the sky; soon after it was finished I discovered a picture in a library book of two business buildings in Paris flush with the ground and descending three stores. From the sidewalk passers by see a few scattered trees in a very large flat, almost bare, grassy park. The interior square hole formed by the sides of the building is scattered with windows and I always wonder if the maintenance people turned on a strong pump when it rains. John and I have created tunnels for our indoor cats, high places to perch, and a plant room. A ladder in the plant room reaches a tangle of dry fat curly willow branches suspended a foot from the ceiling and sky lights. 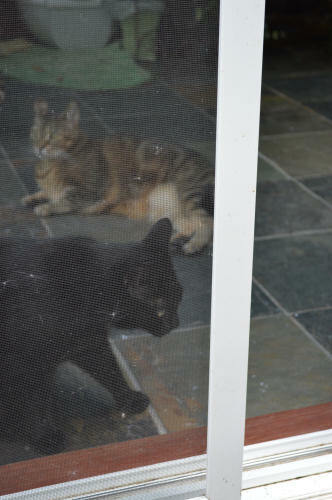 I step outside my plant room and leave the screen open a few feet (saying in a low growl, “You stay there!”) and as I slide the screen the cats move with it and sit behind it, a simple inch away from the opening. It occurs to me as I live the Ten Commandments, it being a road map to joy, I sometimes sit behind a screen when I shouldn’t. I sit beside an open door to adventure as goodness prompts me through. It occurs to me the Race Problem is a screen door problem. At thirteen, Don my younger brother, I and my parents moved to Los Angeles. Mom was undaunted by its bigness and needed to scope out her new home so we took a series of long city bus rides. The most memorable, and one in which Don and I stepped out from behind our screen was from our house in the Jewish area through white areas, Chicano and black areas to downtown LA. We strolled through stores then walked a mile to the Bradbury Building, where many movies are filmed using its interior courtyard and iron lattice railings skirting its numerous balconies. Then we walked back, exhausted by this time, to the down town area and took another long bus ride to Angel’s Flight and Farmer’s Market. When we were done we had hours of bus rides and transfers between us and home and soon the bus filled with working people as they were returning home too. There was hardly standing room and they still packed themselves in with their bundles and lunch boxes. Don and I were trained because we were young people to give our seats to first women then to old men. As soon as we saw the first woman, forced to stand, Don and I squirmed. Why didn’t one of the young kids around her stand up? What was wrong with them, we looked to my Mom but she just watched. We were out of our element, we were the only light skinned persons on the bus and for miles around., The languages we heard were strange, the billboards outside advertised familiar products in exactly the same configuration but with black people hosting the products. To add to the oddness of our new home we knew that when we finally got off the bus at our street we would either have to count the houses from the corner or read the house numbers to find our home because every single house looked alike. We were totally out of our element and wondered, did the same old rules still apply? It was easier to sit behind a screen of blandness than to step an inch into right. Finally Don could stand it no longer; he left my Mom’s side, moved down the aisle to a lady and insisted she take his seat. Then it was my turn and each time the hard working person we’d helped left the bus they helped us back. They insisting we return to the seat we’d once sat in. So we’d sit down a few minutes while we determined who the oldest woman was and did she trump a man, looking even older. Sometimes the person loudly shooed off others away to return “our” seat to us: embarrassing. We played musical bus seats for miles and miles. Lexiconic love is new to me; I use to hate and resent vocabulary. Since marrying John words have become yummy. I’m remembering a few words and I’m trying to catch up for lost time and I even run into a few John doesn’t know. For instance, my brother Don was not pusillanimous. He was totally alive, awake, unique and intense. Non pusillanimous is a current word which describes him well. A very old word describing an imagined severe problem that might just exist in reality is bugbear. In the four ‘Leafman Attacks’ books Anna’s grandmother faces a bugbear of a problem. It comprises of 101 boxes of bugs. Anna, herself, has a worse bugbear in the form of Leafman. I write humorous children’s books and I focus on family, where everyone holds a valued place. I play with words, introducing some and making up others, hoping young people wouldn’t wait as long as I did to love them. “Next time you go,” Brian huffed, “leave Nancy at home.” He was talking about me and the “go” referred to Good Will because we’d called him to help John lug a new purchase, an old armoire, up the porch steps into the house. “Nancy didn’t buy it; I did.” John said in a way that marked him down as honest but hopefully wouldn’t be heard. John and I decided where the new piece of furniture would live, but it still stands in the middle of the room as John buys and applies more and more products to condition the old patina and to wrestle with the old SMELL. He’s worked most of the day and night for a couple of days and when he’s not working he’s staring at it and planning. Give a cat an empty box and that cat wouldn’t be have half as much fun as John is having, in fact he reminds me of my favorite dog Zoey. She was a small dog and loved cows, expressing her joy in various ways. She barked, panted and scratched the windows as we passed the bovines in the car. The first time Zoey was on the ground with the big things she didn’t back down as I thought she would, but raced around a calf or cow and as they curiously bent their heads low to inspect all the action. So Zoey sniffed their noses. She even approached a bull, but we grabbed her and ran before she could greet him properly. Her favorite expression of the bovine interest was to pick up dried cow pies and prance with her tail proudly straight up. The gloopy shaped cow pies looked like giant Frisbees as she stacked them up around our tent. I’m sure her [plan was to take them home as souvenirs! In my funny children’s book ‘Eagles and Banana Peels’ Grandmother invents holidays like Boy’s Day and Rock Day. This afternoon, with this in mind, John created a new holiday too. Not only did my mouth NOT water my toes curled! I’d been thinking about tomorrow’s meals with a mundane, and repetitive dread. Not now! Bread, butter, fruit and cheese again sound’s, mighty good. My “funny” pictures, as I called them, caused deep distress. They were my best solution to the Final project (half my grade) and would be critiqued by the art director of a prestigious magazine. She was one of the few who hired new artists so the other students, who were defiantly showing off their skills, were angry to see my pictures alongside theirs! They laughed and pointed, in derision, at the “joke” and needed to know who’d taken the day so lightly. The art director was pushed into stating which ones she would have chosen to illustrate her article. She kept saying there were only a few, “Lets drop it,” but ‘no’ the class insisted. To the shock of the class mine was selected. My teacher didn’t grade me high, I expected that, because of the seeming lack of skills shown. I consider Van Gough an Outsider Artist rather than an Expressionist and he sums up my feeling. Accentuate the necessary. Diminish and eliminate the superfluous. Don’t we love Shakespeare for exactly that? Do we need to know exactly what Hamlet’s nose looked like, what color his hair was and fingernail style? Is the most essential point of the play, to communicate how ‘pretty’ the world was in this particular year of Hamlet’s life?